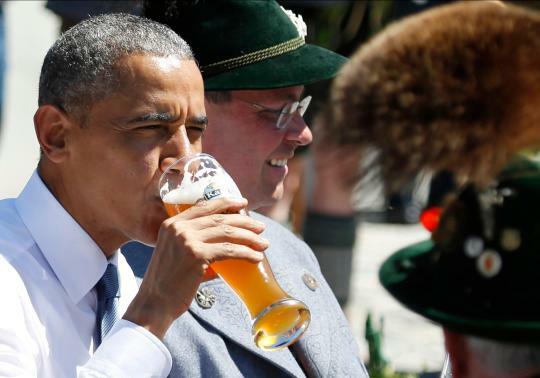 It has been reported by Yahoo News that Obama drinks beer for breakfast in Germany. Apparently the president subscribes to the same theory regarding beer that I do. Any beer consumed prior to 12pm is medicinal. Apparently the president won’t touch a non-alcoholic beer either. Also like me, the president enjoys a good Weisse. Maybe these meetings will produce something useful. The brewery even renamed the wheat beer “Summit Weissbier” in honor of the G-7. Whatever it was, the president clearly enjoyed it. “We should have all our summit meetings in this incredible village and drink beer,” Obama said. These days, it seems President Barack Obama can’t even enjoy a beer without controversy. On Sunday morning ahead of the G-7 summit, Obama and German Chancellor Angela Merkel visited the village of Kruen, where they enjoyed a traditional Bavarian breakfast replete with sausages, pretzels, alpenhorns, men dressed in lederhosen and, yes, beer. Not surprisingly, photos of the president knocking back a tall beer at 11 a.m. local time — about an hour before the socially accepted time for alcohol consumption in the United States — lit up social media. “Why is Barack Obama drinking beer at 11am?” the Drudge Report tweeted. But Kruen Mayor Thomas Schwarzenberger told a Dutch news agency that the beer they served was nonalcoholic at the request of German and U.S. officials. If it was nonalcoholic, the White House said, Obama didn’t order it.